My sweet daughter got engaged on New Year's Day of 2014. So we knew a wedding was coming up, but they couldn't decide when they wanted to have it. Initially they planned a Spring 2015 wedding, but as the summer progressed, they decided to speed things up. I wanted to throw a shower for her, so I enlisted two of my sweet friends, Denise & Renea, to help and we got to planning! Katie had many ideas on her wedding pinterest boards: shabby chic, vintage, country, burlap and lace, chalkboards, mason jars, chevron stripes and hot pink. She's eclectic like me, for sure! 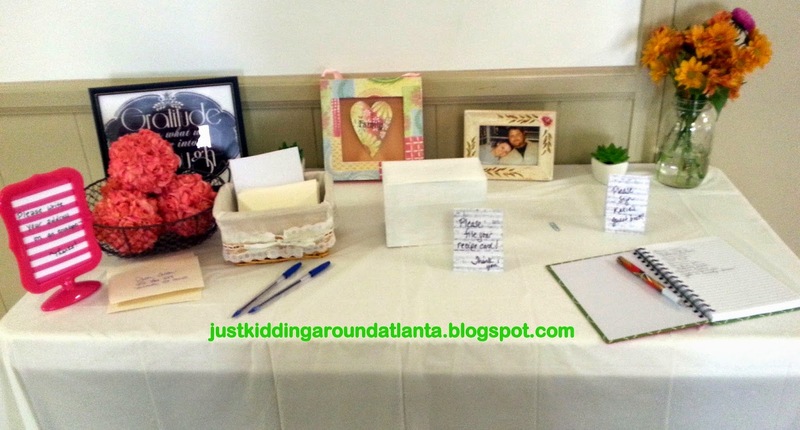 I tried to incorporate each of these elements into her bridal shower. My budget was almost non-existent. My husband was on medical leave most of last summer and money has been tight, to say the least. I think we managed to do a great job, despite the lack of funds, and I found that you CAN throw a great shower on a do-it-yourself budget! For the shower, we used her fiance's church. I never saw the room we were using until the night before her shower when we went to set up. We had some obstacles to work around, including a long row of hooks, several doors, and a big soda machine! But it all worked out in the end. 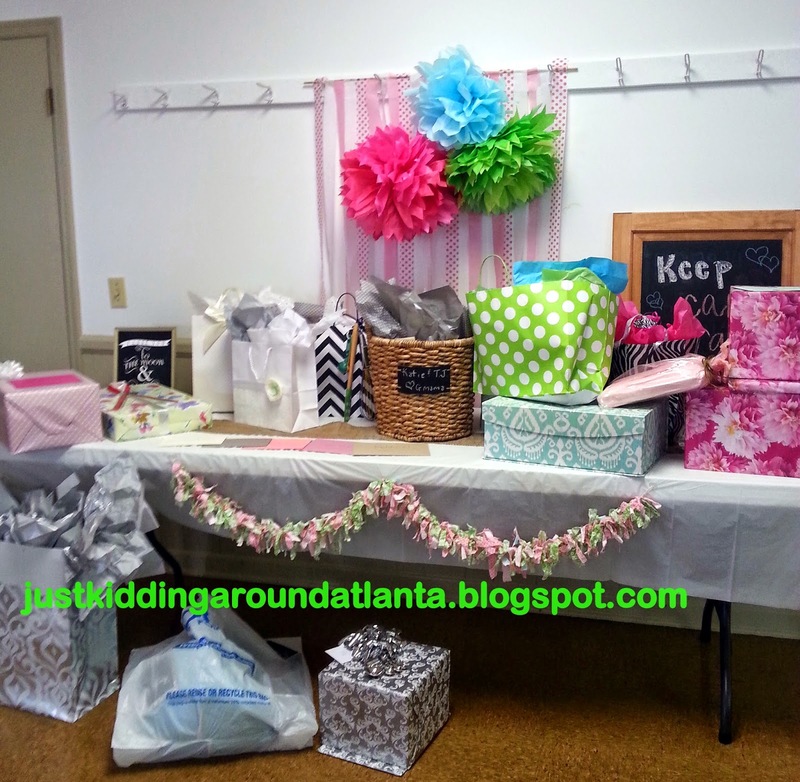 BRIDAL SHOWER GIFT TABLE: I made a backdrop from a dowel I bought at Michael's, and 4 rolls of crepe paper from Dollar Tree (solids) and Michael's (polka dots). I doubled up long lengths (maybe 8 feet each?) of crepe paper, then hot glued the strips to the top of the dowel and let them hang freely. I alternated white/pink/polka dots. I saw many of these on pinterest and etsy and it turned out great! I will be making these for other events - they are easy, cheap and look really cute. I make rag garlands to sell on etsy, but also for decorating our home. When I find fabrics I like, I make several, so I had a couple of garlands in pink and green tones that I used to decorate the front of the table. I bought command hooks to use for this and they failed miserably. Don't waste your money! I ended up taping the garlands to the tables. The plastic tablecloths came from Dollar Tree. My precious sister-in-law Lia taught me to make tissue paper flowers. I picked bright tissue papers and got to work. In the end we only used three above the gift table, and a few by the drink station. They are SO easy. If you want to learn to make them yourself, there are some great step by step tutorials - a quick google search will bring them up! My sister let me borrow two awesome chalkboards she made from old cabinet doors. I wrote on one that we used by the drink station, and she did the other one on the gift table! In her invitations, I enclosed recipe cards (purchased off Etsy) and asked each guest to include a special recipe for the happy couple. So at this table, they could file the recipe cards in her recipe box, address an envelope for thank you notes, and sign the guest book. And I added more pictures and flowers to fill in the spaces! If I could go back in time and edit this table, the basket with rose balls, the little succulent and the square wall hanging with the heart would be gone! BRIDAL SHOWER DRINK STATION: As much as I wanted to buy customized adhesive labels for water bottles, it just wasn't in my budget. So I bought water bottles at Costco, and we used hot pink duct tape to cover the labels. I found a super-cute mason jar drink dispenser, which we filled with sweet tea. We also had sodas. To decorate this area, I used the free printables that I framed, a mason jar of hydrangeas,a chalkboard sign, plus two smaller tissue paper flowers. We used Chinet crystal cups to serve the tea and sodas. 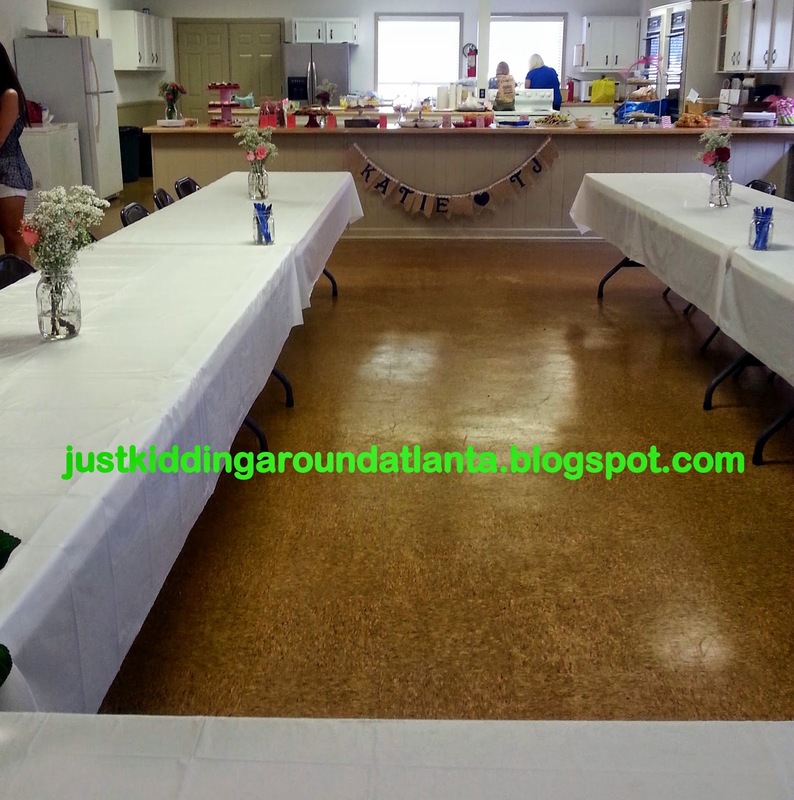 BRIDAL SHOWER SEATING AREA: We used five tables to set up our eating area. I went with a "U" shape, seating our guest of honor at the end table with her friends. 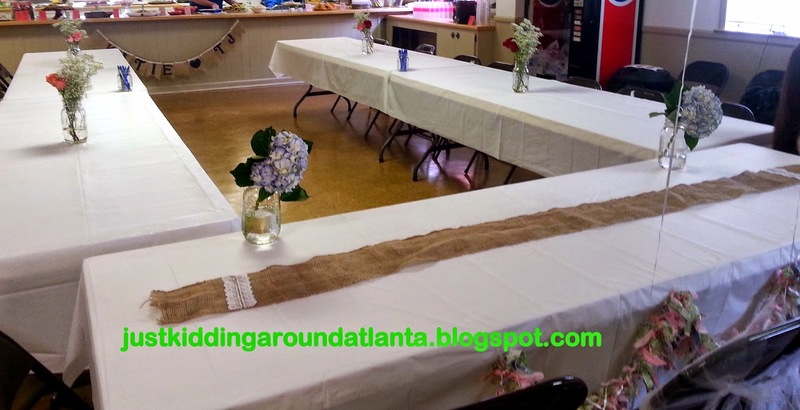 The Bride's table had a long burlap runner. I sewed lace onto the ends of it, and I also added a rag garland to the front. All of the family members sat on either side. The tablecloths were from Dollar Tree. The jars in the middle have pens for our games. Fresh flowers are one of the most expensive components of any shower, and I thought I'd have to skimp on them with the (lack of) budget I had to work with. But luck was on my side! I had to visit three different Kroger stores, but I found amazing flowers the night before the shower. Yes, Kroger marks down their floral department, and I hit the jackpot! Katie loves baby's breath - it is one of her favorites. So I couldn't believe my luck in finding a huge bin of baby's breath bouquets marked down to 99 cents - I think I got 8! And the hydrangeas and roses were also marked down at the second store I visited. Cleaned them out! Finally at the third store, I found a huge bouquet with a variety of flowers that was also marked down, and I was done. At home, I cut them and put them in water overnight. I ended up with probably $100+ in flowers for about $40. Happy happy! They didn't look old, or bad. They were gorgeous! There were a few roses that needed some petals pulled off that were spotted, but they looked great after that. When we arrived at the church Saturday, I made up mason jars for the tables with different flowers. We ended up with a variety of flowers in several colors, but I believe they all looked charming together! So check the local grocery stores and find out when they mark down their flowers - you can find amazing flowers at rock bottom prices. See that adorable burlap garland hanging on the front of the counter? It was made by my super-talented cousin, Morgan. 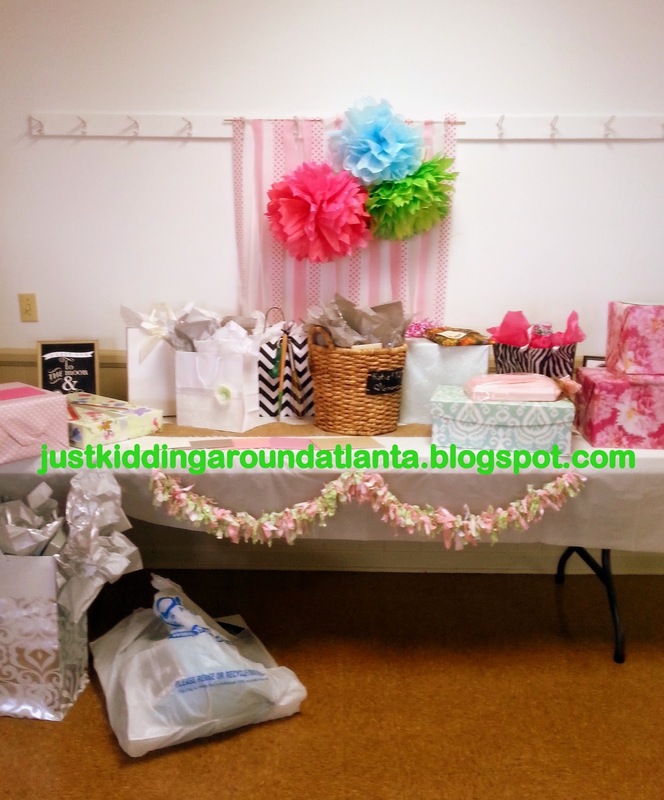 She hosted a shower for Katie in Alabama two weeks before our shower and sent it home for my daughter. Katie wanted me to use it at this shower too.